In 1992 after seventy years of Soviet rule, the small South Caucasus nation of Georgia began a slow and chaotic march to economic freedom. The most important market-liberal reforms began in 2003, after the Rose Revolution. Under the leadership of a committed minister of reform, Kakha Bendukidze, Georgia massively cut its bureaucracy, privatized everything from government-owned hospitals and hotels to electric power plants, lowered both the number of taxes and the tax rate, and liberalized labor laws. The significance of these reforms was soon noticed. The World Bank´s Doing Business report rated the country ninth in the world in ease of doing business, ahead of many far richer countries. According to the report, no country in the last fifty years had carried out such significant economic reforms so quickly and in so many areas. 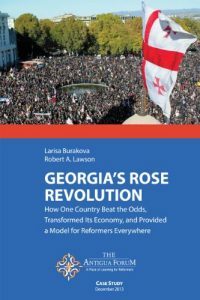 Echoing this view, the United States Agency for International Development remarked that Georgia had made “the broadest, deepest, fastest business climate reforms of any country” over the last half century. Today, Georgia stands as a leading example of how a country can transform itself and obtain a market economy. This case study tells the story of how it happened, with lessons for reformers around the world.